Rasmussen’s encephalitis (RE) is a rare and severe progressive epileptic syndrome with unknown etiology. 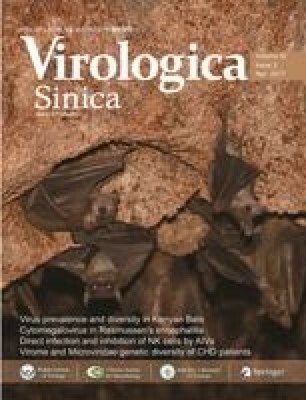 Infection by viruses, including human cytomegalovirus (HCMV), has been speculated to be a potential trigger for RE. However, no viral antigens have been detected in the brains of patients with RE; thus, a possible clinical linkage between viral infections and RE has not been firmly established. In this study, we evaluated the expression of HCMV pp65 antigen in brain sections from 26 patients with RE and 20 non-RE patients by immunohistochemistry and in situ hybridization, and assessed the associations between HCMV infection and clinical parameters. Elevated expression of HCMV pp65 protein and DNA was observed in 88.5% (23/26) and 69.2% (18/26) of RE cases, respectively. 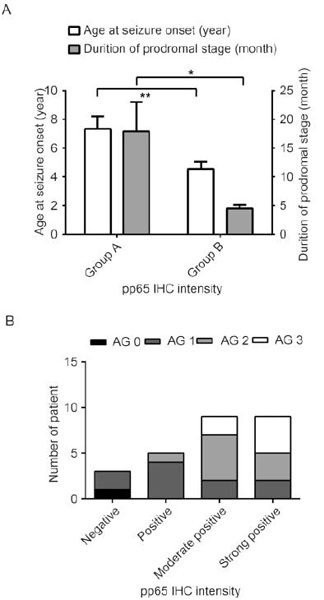 In the non-RE group, HCMV pp65 antigen was detected only in two cases (10%), both of which were negative for DNA staining. Additionally, the intensity of HCMV pp65 staining was correlated with a shorter duration of the prodromal stage, younger age of seizure onset, and more severe unilateral cortical atrophy. Elevated expression of HCMV pp65 was observed in RE brain tissue and was correlated with the clinical features of RE disease. In summary, our results suggested that HCMV infection may be involved in the occurrence and progression of RE disease. Thus, further studies are needed to determine whether early treatment with anti-HCMV antibodies could modulate the course of RE. This work was supported by the following funds: the National Natural Science Foundation of China (81571275), the Beijing Municipal Natural Science Foundation (7144217), the Capital Applied Clinic Research Programs of Science and Technology (Z131107002213171), the Beijing Rising-star Plan of Science and Technology (Z141107001814042), the Open Research Fund of the Beijing Key Laboratory of Epilepsy Research (No. 2014DXBL02), Capital Medical University (15JL08), Scientific Research Common Program of Beijing Municipal Commission of Education (KM201610025001), Scientific Research Foundation for the Returned Overseas Chinese Scholars, State Education Ministry (2014 1685).